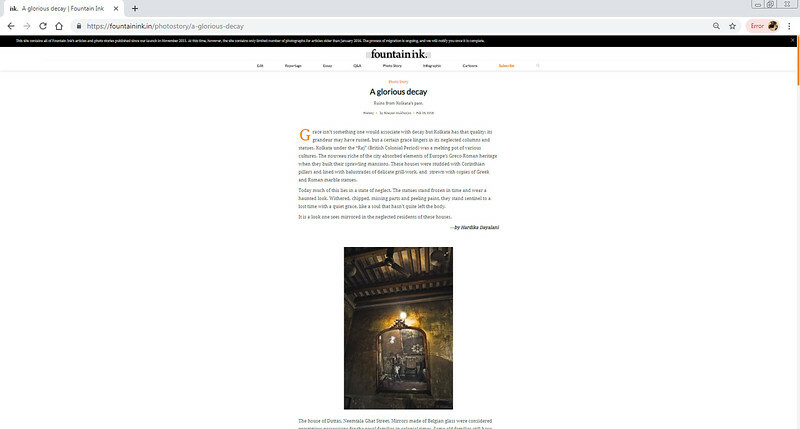 FountainINK's February -2016 issue has featured this 16 page long photo essay "A glorious decay" based on the decaying architecture of Calcutta of the colonial period . The featured essay contains 14 images in total. It's an absolute delight to see the published photo essay especially because of the design and print quality of published images. "Fountain Ink" is an award-winning long-form narrative magazine based in Chennai that comes out once a month. Started in 2011, Fountain Ink has published much-acclaimed pieces on issues of national and international interest ranging from politics to culture.